Sir Norman du Pitkin, Clown Prince of Albania was at the forefront of the philosophical teachings following the Norman Invasion. For those without comedic tastes, the "questionable parody" of this website called Wikipedia have an article very remotely related to Norman Wisdom. Norman Wisdom was the inspiration behind many of the native artistic endeavours within the burgeoning British culture. 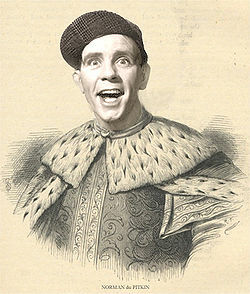 Norman Wisdom (Normana Sapienza) is a phrase utilized by historians to describe the cultural, intellectual and philosophical growth that occurred in 11th Century England following the Norman Invasion of 1066. Many modern authors consider the movement to be too clumsy a term which is seen as random and uncontrolled, though the classification remains in continued use. In recent years some notable voices within the archaeological and historical community have claimed the classification to be far less than stable a term than previously believed, with some considering that the entire construct is too flimsy and liable to fall over. Following the aftermath of the Norman Invasion in 1066, and all that, England became increasingly less insular, looking towards the European mainland and further afield for new methods of learning, agriculture and towards a cultural revolution which many consider to be the end of the Dark Ages and the foundation for the Renaissance. This period formed a paradigm shift that broke away from much of the barbarity which had existed previously, whilst many of today's human rights can be seen to have formed during this transitional time. For the first time in history peasants could expect to receive a bare minimum of twenty-three hours flogging a week with free gruel granted to those working for twenty hours a day or more. Luxuries such as bread and clothing became available amongst the lower-middle-lower class. Amongst the many improvements within society was the recognition that supreme executive power derives from a mandate from the masses, allowing for a more sophisticated governmental system. This would replace the Anglo-Saxon system of government which was built around strange women lying in ponds distributing swords in a farcical aquatic ceremony, itself thought to be one of the founding principles leading to modern day democracy. Another area of exploration during the period of Norman Wisdom was literature. Norman Wisdom is believed to be responsible for the Great Vowel Shift, during which English vowels changed from short, higher notes to longer, more emphatic tones similar to what would be produced if a person tripped over a rake or took a pie in the face. 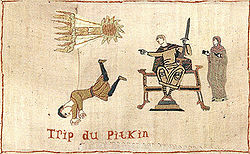 Elder statesman Sir Norman du Pitkin, immortalized within the Bayeaux Tapestry, a stitch in time memorializing the famous event when he stumbled before the Monarch whilst attempting to follow a star. One of the most important figures in the spread of Norman Wisdom is Sir Norman du Pitkin. Son of Steve-o and Maud du Pitkin, Sir Norman excelled as a Knight, leading his cavalry into successful engagements throughout Europe from the rear. During the Battle of Stamford Bridge he had accidentally fought on the side of King Harold, his heroic exploits were such that they formed the main cycle in Geoffrey Chaucer's Old English epic tale "The Knight They Raided Minsky's"
Sir Norman also was an accomplished musician, author, and poet as well as excelling at sports, especially jousting and peasant hunting. He is also credited with bringing the du Gump fashion to England, with its traditional short jacket and tweed cap. Do not laugh at me, for verily I art a fool. Sir Norman was a vassal of Baron Edward Grimsdale, who had considerable lands in Yorkshire and Lancashire as well as connections at Court. 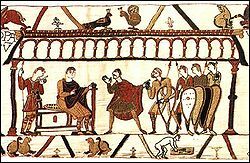 Under his tutelage Sir Norman became adviser to two successive Kings, both William the Conquerer and William II (William Doofus). It was during his time at Court that his passion for philosophy was ignited. The Royal Chaplain Charles famously called him his favourite court jester. During a forty year period he is credited with writing some of the most influential books of the early Middle Ages, including Wit and Wisdom, Wisdom of a Fool as well as a translation of Androcles and the Lion. A series of trips around Europe as a small member of the First Crusade in 1097 provided the inspiration for magnum opus Nobody's Fool. His autobiography, by renowned expert on Norman Wisdom Professor Lee Evans has provided the author with a popular and ongoing speaking career giving discussions on the subject. 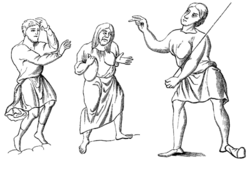 A group of Anglo-Saxon serfs demonstrating the Ancient Art of Slapstick a central tenant within the teachings of Norman Wisdom. Baron Edward Grimsdale: How long will the longboats be? Sir Norman Pitkin: Oh, about 18 feet, Sir Grimsdale. Sir Norman du Pitkin is considered a divinity in Albania where his simple known as Pitkin. This not only gives you an indication of what passes for high comedy in Albania, but also makes Sir Norman the only non-Albanian to be liked in Albania, which is quite ironic as he is the only non-Albanian who knows where Albania is. Their appreciation for Norman Wisdom remains within modern times.